Dubai, UAE, July 11, 2018: “Honor, courage, commitment”, as they say in the US Navy. Ulysse Nardin celebrated over a century of dedi-cation to nautical precision and values shared with the United States Navy by launching a special edition of its Executive Tourbillon: the “Stars and Stripes”. Created in homage to the American flag with its 13 white and red stripes and 50 white stars on a deep blue background, each piece in this limited line of 50 pieces, - one for each state in the Union – is as unique as its wearer. 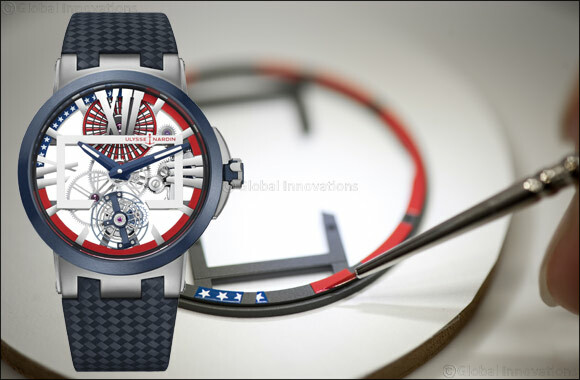 The Ulysse Nardin Executive Tourbillon “Stars and Stripes” was launched on the 4th of July in celebration of America’s Independence Day. The US Navy, known for mottos such as “We shall not perish” equips its sailors with the most precise instru-ments known to man. In choosing its nautical supplier in 1902, it looked no further than Ulysse Nardin for its superb accuracy and traditional craftsmanship. Winner several times over of the Washington Naval Observa-tory’s competition to equip its torpedo boats, Ulysse Nardin’s instruments have been an essential part of US naval ships for more than a hundred years.